Glen Daniel is one of Someone's return clients. 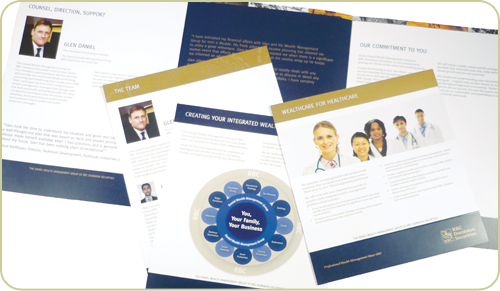 With a long-term understanding of Glen's business, developed over several years of marketing and promotional design, Someone has translated knowledge of this client's goals and precise positioning into a powerful brochure, with interchangeable, target inserts to reach Glen's favored market audiences. 'Throughout the creative process, from marketing consultation, concept and writing, design, illustration and print management, Someone listened closely, provided expertise and advice, and kept my project rolling through to completion without a hitch. 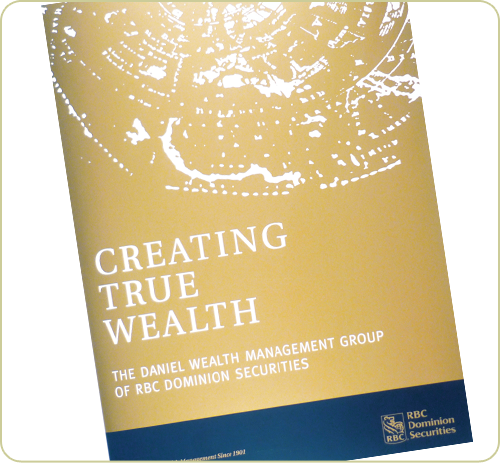 Glen Daniel Vice President & Investment Advisor, The Daniel Wealth Management Group, RBC Dominion Securities Inc.